Some future events involving the Schools of the Bogota Public School district. 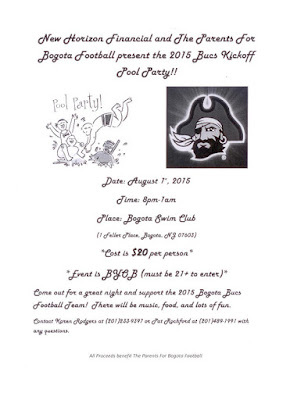 The Parents for Bogota Football in cooperation with New Horizon Financial is hosting their annual Adult Swim. 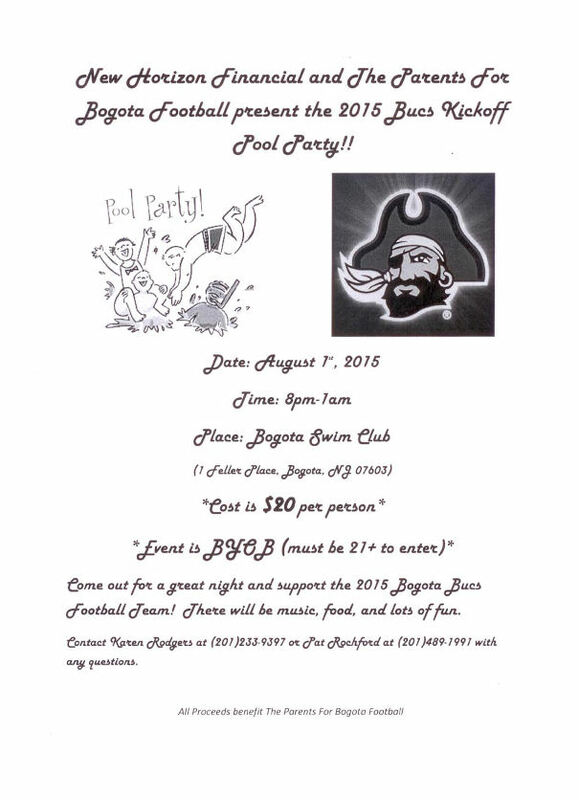 This will be held at the Bogota Swim Club pool starting at 8:00p to 1:00a. Tickets are $20 per person. This is an Adults only event anyone attending must be age 21-years or older with proper id required. There will be live music, games, and food available. This is also a BYOB event but it is asked that any beverage be in a NON-GLASS container. For tickets and other information please contact Karen Rodgers at 201-233-9397 or Pat Rochford at 201-489-1991. First day of training camp will be Monday 3-Aug. This will be held in Olsen Park starting at 3:30p and run until 5:50p. This will be the same schedule for the rest of the week. Practices will only be canceled due to Lightning , or Thunderstorms. Both the Women's and Men's practices start on Monday 17- August at 9:00a Runners are to meet by the High School Gymnasium. Students attending Runners Camp will have their first School practice will be on Monday 24-August at 9:00a. Runners are asked to contact Coach Mahoney about physicals, and permission slips. Also if any runner needs to miss a practice due to vacation , or work please inform Coach Mahoney or any other the other Coaches. The Steen PTO will doing a Summer clean-up of the school yard starting at 9:00a. They will freshening up the play area that were painted two years ago. They are looking for volunteers to help with this project. They will also do a general clean-up of the grounds along with adding new planting near the W. Main St. entrance. Anyone wishing to volunteer please contact Kristin Meberg at: kmeberg311@gmail.com .